This page records changes made to VNC Connect, most recent first. VNC Connect consists of a VNC Server app for computers you want to control, a VNC Viewer app for devices you want to control from, and an online management portal. Where helpful, changes are identified by these categories. This is a release of VNC Viewer for Windows, Mac and Linux computers you want to exercise control from. Download. This is a release of VNC Viewer for Android devices you want to control from. Search ‘RealVNC’ in the Play Store. NEW: Establish a direct connection to a remote computer using the URI syntax vnc://username:password@host:port. If the username and password are omitted, the connecting user is prompted to supply credentials. In order to connect to remote computers, you must enter two separate sets of credentials; your RealVNC account email address and password to sign in, and then the system (username and) password expected by VNC Server to actually authenticate. It should now be clearer which set you have to enter when. This is a release of VNC Viewer for iOS devices you want to control from. Search ‘RealVNC’ in the App Store. NEW: A floating, flickable toolbar is available on all devices. If you have a Professional or Enterprise subscription, benefit from a significant performance improvement without compromising on picture quality, especially for graphically-intensive operations over slow links. More information. NEW: Ensure cloud connections are all peer-to-peer, so no session data is sent via the cloud. More information. NEW: Join a computer to a team (that is, enable cloud connectivity) at the command line using a JSON file instead of a large token. More information. Setting the IpClientAddresses parameter (formerly hosts) to filter incoming direct connections now allows connecting users to specify IPv6 addresses. Disable audit logging to the domain Windows Event Log by setting the LogSessionToDomainLog advanced parameter to FALSE, which might speed up connection time. Audit logging to the local Windows Event Log continues. Start VNC Server in Service Mode from a desktop shortcut, and stop it from the app menu, instead of running commands. Specify the screen capture technology used on a Raspberry Pi (hardware or software) separately from the preferred encoding using the CaptureTech parameter. Use regular expressions in conjunction with the CertificateUserName advanced parameter, to match user names more flexibly. FIXED: The LeftOptKey, LeftCmdKey, RightOptKey and RightCmdKey parameters now map received keysyms correctly. NEW: Support for high-speed streaming in conjunction with VNC Server 6.4.0, above. Share the clipboard contents with the remote computer on session start by setting the SendInitialClipboard parameter to TRUE. If you have an Enterprise subscription, you can mandate that all team members must enable 2-step verification (2FA, using TOTP codes) on their own RealVNC accounts. Failure to comply prevents them remotely accessing team computers. See how to set this up. NEW: Provide a comprehensive multi-factor authentication scheme for Mac and Linux computers using interactive system authentication to integrate with your choice of PAM authentication modules. NEW: Blank the screens of Windows 8 and 10 computers in addition to Windows 7 and earlier computers. Note screen blanking is only likely to be effective for monitors attached to desktop computers, and not laptop displays. Test your system in advance using the tool provided on VNC Server’s Options > Privacy page. More information. Remove a computer from your team (that is, prevent discovery by RealVNC’s cloud service) at the command line using -leavecloud. More information. Specify a friendly name for a computer whilst adding it to your team at the command line using -joinname. More information. FIXED: Connecting users supplying Active Directory credentials should find authenticating to VNC Server on Windows is quicker. FIXED: VNC Server is now more integrated with LDAP when the smartcard/certificate store authentication scheme is selected. FIXED: Users should experience fewer blank screens when connected to Windows computers with the screen saver enabled, or Intel Ready Mode Technology installed. FIXED: Connected users with a left-hand mouse or with mouse buttons switched can now interact remotely in the expected way. FIXED: VNC Viewer no longer crashes when connecting directly to a computer that has spaces in its hostname. Improved Bluetooth keyboard support for iOS 12. FIXED: Speech recognition input when dealing with large quantities of text no longer suffers from performance issues. This is a release of the run-once app that end users download in order to receive instant support. Download. NEW: End users are warned if their instant support session originated from a 30 day free trial of VNC Connect. End users now get an interface that is automatically localized into their desktop language. These patch releases fixed issues with cursors and app crashes on certain devices found in VNC Viewer for Android 3.4.0, below. This is a patch release of VNC Viewer for Windows, Mac and Linux computers you want to control from. Download. FIXED: VNC Viewer now starts on macOS even if an invalid URL has been entered into the Mac’s System Preferences > Network > Advanced… > Proxies > Automatic Proxy Configuration > Proxy Configuration File URL field, for either Ethernet or Wi-Fi. NEW: Support for Android Oreo and Pie, and arm64 processors for improved performance. FIXED: Address books with more than 30 computers now synchronize correctly between all your devices. This is a patch release of VNC Server and supporting programs, for installation on remote computers you want to control. Download. FIXED: Under Linux and macOS, VNC Server now accepts domain license keys once more. FIXED: Under macOS, the VNC Server postflight installation script no longer kills the loginwindow process, so other service operations continue without interruption. FIXED: VNC Server now attempts to use both system and user proxy server settings (in that order) when communicating with RealVNC services in order to license the software. FIXED: Under Windows, VNC Server should now start in circumstances where Windows Firewall fails to respond properly. This is a release of VNC Viewer for Windows, Mac and Linux computers you want to control from. Download. NEW: A new encoding, ZRLE2, is now the default, which means that most users should experience better performance in conjunction with VNC Connect 6.3.0, below. VNC Viewer can now log to a centralized logging facility such as syslog or Event Log. On Windows, VNC Viewer now supports high contrast mode. This is a release of VNC Server and supporting programs, for installation on remote computers you want to control. Download. NEW: Support for Ubuntu 18.04 LTS. Note Wayland is not supported, so for VNC Server in Service Mode you must edit the /etc/gdm3/custom.conf file, uncomment WaylandEnable=false, and reboot in order to remotely access the login screen. NEW: If VNC Server is configured to use Smartcard/certificate store authentication, certificates from connecting users are automatically checked for revocation using OCSP, before falling back to CRLs. To use only OCSP, set the LdapCertificateRevocation parameter to EnforceOcsp. Under Windows, if VNC Server is configured to use Smartcard/certificate store authentication, certificates from connecting users are now checked against the Enterprise NTAuth store, rather than the Root store. If VNC Server is configured to use single sign-on authentication (SSO), connecting domain users with Active Directory accounts in different forests are now checked, providing cross-forest trust relationships are in place. Under Windows, if VNC Server in Service Mode is configured to log to file (rather than Windows Event Log), the default destination directory is now C:\ProgramData\RealVNC-Service. FIXED: Under Linux, VNC Server in Virtual Mode sessions no longer leak audio to local speakers. FIXED: Under Windows, the DisplayDevice parameter now recognizes monitors plugged into multiple or discrete graphics cards. NEW: Control a remote touch panel directly, rather than using the device screen as a trackpad. To do this, select Interaction > Touch panel from a connection’s settings, either before or during a session. The connection method (whether cloud or direct) is now displayed on a session’s information screen. FIXED: Hardware keyboard left and right arrow keys now work when the scrolling function key bar is active. This is a minor release for VNC Viewer on iOS devices to connect from. Search ‘RealVNC’ in the App Store. NEW: Support for iPhone X. Unpinning the VNC Viewer toolbar now reveals a movable floating toolbar. FIXED: VNC Viewer now only replaces two consecutive hyphens -- with an em dash - if keyboard auto-correct is enabled via the app Settings. FIXED: VNC Viewer no longer crashes when the hyphen key is pressed, or any key is held down, on a connected Bluetooth keyboard. This is a patch release for VNC Server and supporting programs installed on remote computers you want to control. Download. The message displayed on accept/reject prompts can now be customized using the VNC Server QueryConnectMessage parameter. The custom message can be up to 4096 bytes in length, and utilize the HTML <br/> syntax to insert new lines. VNC Server now checks Certificate Revocation Lists up to 25MB in size when smartcard/certificate store authentication is enabled. A larger value can be specified using the VNC Server LdapCertificateCrlLimit parameter. 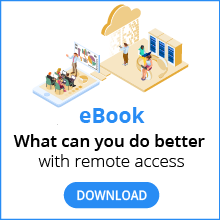 Add instant support to your VNC Connect subscription and connect on-demand to computers that do not, or cannot, have remote access software installed. Find out more. If you are an existing customer, you can try this new capability free for 30 days by signing in to your RealVNC account, navigating to the Account page, and choosing to start either a new Professional or Enterprise trial. Then, download the latest version of VNC Viewer for Windows, Mac or Linux, and follow these instructions to start your first session. VNC Viewer is now ready to conduct instant support sessions (see above) from supported Windows, Mac and Linux computers. Download. NEW: VNC Connect is now available in Brazilian Portuguese. NEW: Under Red Hat Linux distributions, VNC Server in Virtual Mode can now utilize the version of the Xorg server running on the system, rather than the out-of-date version built-in to Xvnc. Desktop environments such as Gnome 3 and modern applications and extensions will likely be compatible out-of-the-box. See how to set this up. The VNC Connect download now consists just of VNC Server and supporting programs, for computers you are licensed to control. VNC Viewer is no longer bundled. You are free to download VNC Viewer to as many computers and devices you want to control from as you like. VNC Viewer for macOS is now a disk image (DMG) that you can install by dragging it to the Applications folder. In VNC Viewer, you can now drag-and-drop a computer onto a label in the sidebar to assign that label to the computer. To create a new label, right-click on the Address book. You can set the QueryOfferViewOnly VNC Server parameter to FALSE to remove the view-only option from the prompt shown when VNC Viewer users are attempting to connect (leaving just the reject and accept options). FIXED: VNC Server’s Information Center dialog no longer shows an erroneous error message when the legacy SecurityTypes parameter is set to a value other than <auto> (this may affect users upgrading from VNC 5.x). FIXED: VNC Server in Virtual Mode (Xvnc) no longer crashes due to a bug in the X11 render extension. For a video explaining major features, and links to other resources, please see our release summary page. NEW: VNC Server supports multi-factor authentication. Choose a scheme based on X.509 digital certificates stored on pluggable smartcards/authentication tokens or in certificate stores, or a RADIUS server implementation from an identity management provider such as RSA SecurID or Duo. Alternatively, create a custom scheme containing as many factors as you need. NEW: Conveniently assign discovery permissions to computers in your RealVNC account by creating groups of people and computers. Restricting discovery improves security, and helps team members reduce the number of computers they interact with in VNC Viewer. NEW: Organize computers in VNC Viewer using labels. Right-click on the address book to create a new label, or assign a label to a computer on its Properties page. NEW: Display a details view of computers VNC Viewer instead of a screenshot icon view, and sort by name, last connected time, and label. More intuitive scaling options for the remote computer desktop are now available from VNC Viewer’s Properties page. VNC Server now prompts you to send anonymous usage data to RealVNC, to help improve the user experience. You can opt out on VNC Server’s Options > Privacy page. The VNC Server in Virtual Mode daemon now fully supports persistent virtual desktops. The ConnectToExisting parameter no longer requires an underscore (denoting a beta feature). FIXED: Your computer now recovers automatically if it wrongly reports that it has been cloned. NEW: VNC Connect is available for Raspberry Pi. It is included with Raspbian, and pre-licensed to offer both cloud and direct connectivity to Home subscribers. NEW: VNC Viewer has a medium setting for the picture quality of a remote desktop, to complement high and low. By default, the picture quality is automatically adjusted to suit the speed of the network. VNC Connect is available in French, German, and Spanish again. The appropriate language for the desktop of each user is automatically selected. This can be changed (if required) using the Locale parameter. The VNC Server user interface now makes it easier to enable cloud connectivity if you have an Enterprise subscription or trial. VNC Server now prompts for administrative credentials (where necessary) in a more timely manner under Linux. NEW: VNC has a new brand name, VNC Connect. VNC Server and VNC Viewer have new brand colors, icons and logos. NEW: VNC Connect is licensed by annual subscription rather than perpetual license key. When a paid Professional or Enterprise subscription expires, remote access stops. If you’re an existing, entitled VNC 5.x customer, you can automatically upgrade to a new Enterprise subscription. NEW: Establish secure, seamless, reliable cloud connections from VNC Viewer to VNC Server. If you have an Enterprise subscription, this can be as well as, or instead of, traditional direct connections. NEW: Invite people in to your team to quickly share remote access, and manage computers, subscriptions, renewals and payment methods much more conveniently online using your RealVNC account. NEW: Sign in to VNC Viewer with your RealVNC account credentials to backup and sync your address book between all your desktop and mobile devices. NEW: VNC Address Book is integrated into VNC Viewer, so everything is accessible from one place. Use File > Import connections to transfer VNC 5.x connections in from VNC Address Book, or from a directory of .vnc files. NEW: VNC Viewer can remember remote access credentials so you don’t have to enter them each time. Note under Linux we additionally recommend setting a master password for VNC Viewer; see below. NEW: Use File > Preferences > Privacy to set a master password to protect VNC Viewer from unauthorized use. NEW: Save desktop previews for connections (that is, screenshots in thumbnail form) to make VNC Viewer more intuitive to use. NEW: Give connections friendly names. NEW: Quickly forget sensitive data such as passwords and desktop previews if VNC Viewer is running on a shared computer. NEW: If you start VNC Viewer and simultaneously establish a direct connection at the command line, use the -useaddressbook flag to integrate with your address book, for example vncviewer -useaddressbook 192.168.1.99:65. If the connection is to a known computer, stored settings are applied. If the connection is to a new computer, it is added to your address book. NEW: Configure the rate at which a desktop is panned when in full screen mode using the BumpScrollSpeed VNC Viewer parameter. VNC Server now needs an Enterprise subscription in order to run in User Mode or Virtual Mode. Only direct connectivity is available in these modes. VNC Viewer now sets File > Preferences > Proxy to the system proxy server by default, rather than to no proxy server. VNC Deployment Tool and VNC Viewer for Java are no longer supported. NEW: Support for Windows Server 2016. Full supported platforms list. NEW: Support for macOS 10.12 Sierra. Note that only 64-bit package files are available for macOS 10.10, 10.11 and 10.12. NEW: Support for Ubuntu 16.04 LTS. The process of installing VNC Connect without administrative privileges is now simpler. FIXED: Setting the DisableTrayIcon VNC Server parameter to 1 now correctly removes the VNC Server icon from the notification area. VNC Connect is only available in English. Spanish, French and German versions will follow soon. After resuming from sleep, it may take a minute or so for your VNC Server computer to be available for cloud connections. Standard selection mechanisms such as CTRL-A or holding down the SHIFT or CTRL key while clicking do not yet allow you to select multiple connections in VNC Viewer. Choosing File > Export connections in VNC Viewer to export to .vnc files exports all connections, not just the one currently-selected. VNC Server no longer reports that support and upgrade entitlement has expired if you currently have a valid VNC Connect (version 6) subscription. FIXED: VNC Server now correctly captures a desktop set to span multiple monitors with different DPI settings. FIXED: Setting the poll parameter to a number of milliseconds (for example 200) in an appropriate configuration file (such as ~/.vnc/config.d/vncserverui-virtual for Virtual Mode) or /etc/vnc/common.custom (for all modes) now works around copy and paste issues in X applications such as gVim. If VNC Viewer is minimized while in full screen mode, it no longer automatically returns to full screen mode for any reason. Setting the advanced AlterShiftWithMods VNC Server parameter to 0 allows VNC Server to inject key combinations such as Ctrl+C, even if the connected VNC Viewer user has Caps Lock enabled. FIXED: Importing a connection into VNC Address Book now also imports that connection’s VNC Server password, if one has been saved. FIXED: The name and location of VNC Server’s private RSA key can now be successfully configured via the RsaPrivateKeyFile parameter. FIXED: Installing VNC Server in a non-default location no longer causes connected VNC Viewer users to see a black screen. SELinux policy modules are automatically registered on Red Hat-compatible distributions (version 5.0+ only) if SELinux is enabled during installation or upgrade, meaning the vncserver-x11-serviced and vncserver-virtuald daemons, and printing, work out-of-the-box. On Debian-compatible distros, or if SELinux is enabled later, you can register the policy modules manually. NEW: Providing VNC Server and VNC Viewer are both version 5.3, connections use the very latest RFB 5 protocol for enhanced security, with updated cipher suites and support for Perfect Forward Secrecy. NEW: VNC Server with an Enterprise or a Personal license can restrict the IP addresses on which it listens for connections, reducing the attack surface. Note the InTransports parameter has been removed, which means VNC Server with a Free license can no longer listen on just IPv4 addresses, or on just IPv6 addresses. NEW: VNC Viewer can send keep alive messages to VNC Server in order to maintain (perhaps minimized) connections that might otherwise be considered idle by routers or gateways, and unexpectedly terminated. Conversely, the same mechanism can clean up connections that have terminated, perhaps due to network failure. NEW: VNC Server has a new screen capture architecture that is both more robust and responsive. Users should see fewer disconnections and reconnections when transiting between desktop and login screens. System administrators should be aware of a new vncagent binary and process. Screen capture on Windows 8+ computers using DirectX is now more efficient, giving a better user experience. As part of this work, the UpdateMethod parameter has been renamed CaptureMethod on all platforms, and has new defaults that make choosing the optimal capture method easier. Configuring security for VNC Server at the command line or using policy is now simpler using new, separate, more intuitive Authentication and Encryption parameters. On upgrade, SecurityTypes and UserPasswdVerifier values are mapped appropriately unless a VNC password is mandated using policy. The vncpasswd utility now has flags that make specifying a VNC password for VNC Server in all modes easier. In addition, running the utility without a flag now shows the help rather than defaulting to VNC Server in User Mode. The Password parameter is now included in policy template files so VNC Server with an Enterprise license can be remotely provisioned with a VNC password. To obtain a password in the correct obfuscated format, run vncpasswd -print. NEW: Support for Windows 10. NEW: VNC Viewer can send media keys such as Play and Volume Up to VNC Server. NEW: VNC Server can remap keys received from VNC Viewer, perhaps to inject a non-native character or control key. NEW: Support for Ubuntu 15.04—15.10, Debian 8, Red Hat/CentOS 7, and Fedora 21—23. By default, VNC Server in Service Mode now logs to the syslog USER facility, and the VNC Server in Virtual Mode daemon to the DAEMON facility, instead of to file (note other facilities are available). VNC Server in Virtual Mode now checks up to 500 X display numbers for the next available display, up from 99. Note that X displays in the range 0-99 are mapped to ports 5900-5999 as before; subsequently, the mapping is as follows: 100-199 (ports 7100-7199); 200-299 (ports 7300-7399); 300-399 (ports 7500-7599); 400-499 (ports 7700-7799). Users in the sudo group can now authenticate to VNC Server in Service Mode with an Enterprise or a Personal license on Linux platforms out-of-the-box. This is in addition to users in the admin group and the root user. NEW: Support for 10.11 El Capitan. NEW: On 10.7+ computers, VNC Viewer can be made full screen in the same way as any other Mac app. Note this does mean the app window can no longer span multiple monitors. To do this, revert to legacy full screen mode. VNC Viewer can now send special keys such as Cmd+Tab and the Spotlight shortcut to VNC Server whenever the app window has focus, and not just in full screen mode. By default, VNC Server in Service Mode now logs to syslog instead of to file. FIXED: Accept/reject prompts now appear correctly if a host computer user logs out while VNC Viewer users are connecting. FIXED: Re-installing or upgrading VNC on certain platforms no longer results in duplicate PAM entries that can prevent connections. FIXED: The VNC Server in Virtual Mode daemon (vncserver-virtuald) no longer crashes the host computer if VNC parameters or Xvnc options in configuration files are specified in the wrong format. The TryLegacyCaptureMethod VNC parameter can be set to 1 if screen corruption is experienced when connected to headless servers running OS X 10.10 Yosemite. The DisplayDevice VNC Server parameter now remotes virtual monitors that have been force-detected. FIXED: vnckeyhelper.exe, a support utility that enables connected users to perform privileged key presses such as Alt+Tab securely, no longer checks online for revoked certificates. NEW: Support for Ubuntu 14.10. Note that if you are using VNC Server in Virtual Mode, you will need to change the default desktop environment. FIXED: VNC Server in Virtual Mode no longer crashes on low-color depth displays when a session is shared and a second user connects. NEW: Support for OS X 10.10 (Yosemite). FIXED: VNC Viewer should now start correctly in all circumstances. FIXED: Active Directory users and groups in different domains can now be registered with VNC Server using the Users & Permissions page of the Options dialog box. FIXED: The Minimize and Maximize buttons on the VNC Viewer shortcut (F8) menu now work correctly. FIXED: The VNC Server status icon should now appear when you log on to the root user account on a host computer. FIXED: Second and subsequent media keys (such as Volume Up or Mute) are now sent to VNC Server, and the equivalent physical keys on the keyboard attached to the host computer are no longer disabled. NEW: VNC is available in French, German, and Spanish. The appropriate language for the desktop of each user is automatically selected. This can be changed (if required) using the Locale VNC parameter. VNC parameters that parse environment variables (such as LogDir) now resolve the syntax $$ to a literal $, for example to accommodate such a character in a folder name. FIXED: The VNC Viewer chat interface no longer prevents a user account password being entered at the Login window or lock screen. Chat and file transfer are no longer separate applications but rather merged into the vncserverui.exe program. To configure chat and file transfer using Group Policy, examine the VNC Server > mode > User Interface policy folder. FIXED: VNC applications can now be run from user accounts with a $ character in the account name. FIXED: Active Directory groups with ‘universal’ scope can now be registered with VNC Server on the Users & Permissions page of the Options dialog, in addition to groups with ‘global’ and ‘domain local’ scope. VNC Server in Service Mode (vncserver-x11-serviced) and the VNC Server in Virtual Mode daemon (vncserver-virtuald) can now be started using systemctl on Linux distributions that support systemd, such as the latest Fedora. VNC Server now supports PAM session modules, and session actions in pam_umask.so, pam_limits.so, pam_env.so, and pam_unix.so are automatically referenced in /etc/pam.d/vncserver (or equivalent file). Chat is no longer a separate application but rather merged into the vncserverui program. To configure chat using policy, edit the vncserverui-<mode> policy template file. FIXED: VNC hosted on a network share no longer relies on the cacerts.pem file. NEW: VNC Server in Service Mode can lock the computer or start the screensaver when the last VNC Viewer user disconnects (not available under OS X 10.4). VNC Chat.app no longer reads from the /Library/Preferences/com.realvnc.vncchat.plist file. To configure chat using policy, edit the vncserverui-<mode> policy template file. FIXED: VNC Viewer no longer prevents media keys such as volume or brightness from affecting the client computer. FIXED: An issue when setting the same port for VNC connections (RfbPort) and for VNC Viewer for Java downloads (HttpPort). Automatic update checks can now be controlled when installing VNC at the command line. FIXED: VNC Server no longer incorrectly reports that a standard license key is not valid for the current domain. FIXED: Users can now connect if the display is asleep even if a password is required to wake the display. NEW: VNC Server can check whether critical software patches, and product updates to which you are entitled, are available to download from the RealVNCweb site. NEW: VNC Server publishes a more-memorable catchphrase than the unique signature on which it is based, deterring man-in-the-middle attacks by making identity checks more intuitive for connecting users. NEW: Message boxes displayed when connections are unexpectedly terminated can now be suppressed using the HideCloseAlert VNC Viewer parameter, making scripting easier. The VNC Server Options dialog has been made easier to use, and highlights features locked down by policy. For both VNC Server and VNC Viewer, it also simplifies the process of creating debug log files to send to RealVNC Support. VNC Server logs are now directed to file at more appropriate locations, as determined by the new LogDir parameter. The VNC Server Information Center dialog now distinguishes between successful and unsuccessful connections on the Diagnostics page, which may give warning of a port sniffing or brute-force dictionary attack. All instances of VNC Server running on a computer can be reconfigured without downtime using the vnclicense -reload command. VNC parameters are now fully documented. FIXED: Copying and pasting text from connected computers is now more reliable. See also the ServerClipboardGraceTime VNC Viewer parameter. NEW: Separate MSI installers for VNC Server and VNC Viewer are available for download for deployment to target computers in a Group Policy Object. VNC Server can also be licensed at install-time using a Group Policy transform. FIXED: Key combinations such as Alt+Tab are now supported for connections to Windows 8 computers. Note VNC Server must be installed to a secure location such as C:\Program Files. FIXED: Second and subsequent monitors plugged-in to discrete graphics cards on Windows 8 computers are now remoted to connected users. NEW: Support for Ubuntu 13.10, Debian 7 and Fedora 19. NEW: The RootSecurity VNC Server parameter protects the system credentials of connecting users from observation by a VNC Server owner who is not root. NEW: The VNC Server in Virtual Mode user interface can be hidden using the advanced StartUI VNC Server parameter. NEW: VNC Server in Virtual Mode can clean up stale sockets and release display numbers using the vncserver-virtual -clean command. VNC Server in Virtual Mode now creates a virtual desktop with a default color depth of 24 (32 bits-per-pixel). Under AIX, PAM can be substituted for LAM more easily using the new UsePam VNC Server parameter. The vnclicense utility can manage license keys in locations other than the default /etc/vnc using the new LicenseDir parameter. This is especially useful when installing on a network share. The man pages have been rewritten. The vnclicense utility can manage license keys in locations other than the default /etc/vnc using the new LicenseDir parameter. FIXED: Local users can no longer execute arbitrary code as root by passing a maliciously crafted argument to the VNC Server in User Mode (vncserver-x11) or Virtual Mode (Xvnc) setuid-root helpers. Note this issue only affected 5.0.6. See CVE-2013-6886. FIXED: Local users can no longer execute arbitrary code as root by passing a maliciously crafted argument to the VNC Server in User Mode (vncserver) setuid-root helper. Note this issue only affected 5.0.6. See CVE-2013-6886. NEW: Support for Windows 8.1. NEW: The AutoLogonOverride VNC Server parameter enables connected users to hold down the Shift key while logging off in order to prevent the same user account being automatically logged back on. NEW: Support for 10.9 (Mavericks). FIXED: The VNC Server - File Transfer dialog now always appears. The BlacklistTimeout VNC Server parameter now accepts a number of seconds between 1 and 2147483647. Improvements to CUPS printing backend. FIXED: Text can now be copied and pasted in either direction if the connection was originally made to a computer at the login screen (that is, not yet logged on to a particular user account). NEW: The mouse cursor snaps to a corner of the host computer’s desktop if it exits the VNC Viewer window within a certain distance of a corner (configurable via the PointerCornerSnapThreshold parameter), making it easier to trigger hotspots under the latest operating systems (particularly Windows 8 and Mac OS X 10.8). Improved support for Windows 8. Under Windows 8, connection notification messages are now displayed on the Start screen as well as in the Desktop app. Under Windows 8, Desktop Duplication replaces VNC Mirror Driver as the optimal screen capture mechanism in most circumstances. VNC authentication passwords are now created using the vncpasswd utility, rather than specified using multiple parameters. FIXED: If connection notifications are disabled, messages are no longer shown when subsequently logging on to an account on the host computer. FIXED: Multiple and collated copies of documents can now be printed to local printers. FIXED: VNC Server no longer monitors the host computer’s clipboard so frequently, minimizing clashes with applications such as Excel. FIXED: VNC Server no longer displays erroneous 10061 error messages when starting up on slow computers. The VNC Server in Virtual Mode daemon (vncserver-virtuald) now respects the BlacklistThreshold and BlacklistTimeout parameters in order to prevent denial-of-service attacks. FIXED: VNC Server in Service Mode no longer reports error 10038 (SetBlocking) when run in conjunction with certain third party software. NEW: Support for 10.8 (Mountain Lion). VNC is a signed (that is, legitimate) application for download from the Internet. NEW: Support for Mac Book Pro computers with Retina displays. FIXED: Connections can now be established to a computer whose display is asleep (lower of the two sliders in the System Preferences > Energy Saver pane). Note connections cannot be established if the computer itself is asleep. FIXED: RDP connections to 32-bit XP computers now succeed when VNC Server is running in Service Mode. Note that VNC Viewer users who subsequently connect must request control, since VNC and RDP connections cannot co-exist; the RDP user may or may not grant control requests. FIXED: VNC now installs on case-sensitive HSFX file systems. FIXED: Multiple monitors attached to 10.6 (Snow Leopard) computers are now displayed correctly. FIXED: The graphical Licensing Wizard can now always be used to license VNC Server. NEW: VNC Server providing basic remote control freely available across all supported platforms. NEW: VNC Server containing premium security and performance features available for use across all supported UNIX/Linux and Mac OS X platforms. NEW: Apply a license key at any time to unlock premium features without installing software. NEW: The same license key can be applied on any platform, simplifying mixed deployments. NEW: Grace period of seven days in which to license VNC Server permanently after trial, or if an existing license key has expired. NEW: VNC Server user interface with improved access to diagnostic and troubleshooting information, and a licensing and repair wizard. NEW: VNC Viewer can automatically reconnect in certain circumstances, for example when a host computer user logs or switches out. NEW: VNC Viewer explicitly warns about unencrypted connections. NEW: VNC Viewer can connect via SOCKS/HTTP proxy servers that require BASIC authentication. NEW: Support for Windows 8 Release Preview. The VNC Server executable has been renamed from winvnc4.exe to vncserver.exe. VNC Server in Service Mode no longer automatically restarts if it was explicitly stopped before a computer is rebooted. VNC Server in Service Mode need no longer be pre-registered before it is started at the command line. VNC Server no longer requires a separate vncconfig utility in order to permit configuration. NEW: Support for Mac OS X 10.7 (Lion) Server. The VNC Server binary has been renamed from macvnc to vncserver. VNC Server configuration files are now located in ~/.vnc/config.d (User Mode) and ~/var/root/config.d (Service Mode) directories, rather than settings in prefs files. VNC authentication passwords are now stored in standard configuration rather than in separate password files. RSA public/private key pairs can now be generated by a single command rather than a separate vnckeygen utility. Single-sign on authentication is now implemented using a symbolic link rather than the SSOLib VNC parameter. NEW: Support for Ubuntu 11.04+, Debian 6, RHEL/CentOS 6, Fedora 14+, and Solaris 11. NEW: VNC Server in Service Mode re-implemented and available across all supported platforms. The VNC Server in User Mode binary has been renamed from x0vncserver to vncserver-x11. The VNC Server in Virtual Mode binary has been renamed from vncserver to vncserver-virtual (note vncserver is now a symbolic link). VNC Server no longer requires a separate vncconfig utility in order to permit configuration and operations such as file transfer and copy and paste text.